Hundreds of displaced Hindus are seeking shelter in Sittwe, the capital of violence-wracked Rakhine state. SITTWE (MYANMAR) - Hindus once sold food to Rohingyas, spoke the same language and even cut the hair of their Muslim neighbours. But co-existence among the collage of ethnicities in Myanmar's Rakhine state has been ruptured -- perhaps irreversibly -- by the bloodshed of the last month. Violence has periodically cut through the western state, where communal rivalries have been sharpened by British colonial meddling, chicanery by Myanmar's army and fierce dispute over who does -- and does not -- belong in Rakhine. "All of our family died at the village... we will not go back," said Chaw Shaw Chaw Thee, one of hundreds of displaced Hindus seeking shelter in the state capital Sittwe. It was not immediately clear if they belonged to Chaw Shaw Chaw Thee's family. Hindus, who make up less than one percent of Rakhine's population, accuse Rohingya of massacring them, burning their homes and kidnapping women for marriage. 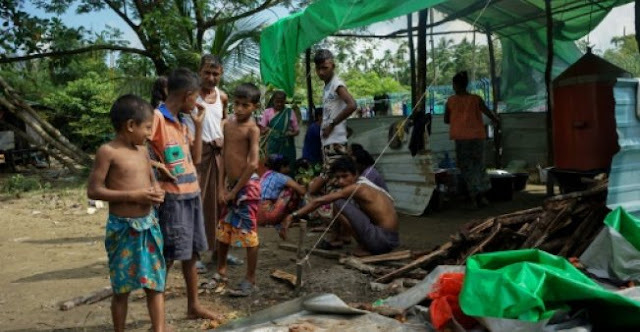 Meanwhile the Rohingya, some 430,000 of whom have fled to Bangladesh, trade accusations with ethnic Rakhine Buddhists of grisly mob attacks and army "clearance operations" that have emptied their villages. "We were barbers for Muslims, our women sold things in Muslim villages, I had Muslim friends, we had no problems," said Kyaw Kyaw Naing, a 34-year-old Hindu who can dance across linguistic divides in Hindi, Rakhine, Burmese and Rohingya. Community ties in what is also Myanmar's poorest state have now unravelled. "We want to go back, but we will not if the Muslims are there." Last week Myanmar's leader Aung san Suu Kyi told the international community that Rohingya refugees were welcome back if they were properly "verified". Myanmar's powerful military insists they are "Bengalis" who were first brought to the country by British colonisers and have continued to pour in illegally ever since. "It can't be solved in the short-term... to be stable and harmonious could take decades," Oo Hla Saw, a lawmaker for the Arakan National Party, which represents Rakhine Buddhists, told AFP. Rakhine's history is bitterly contested and flecked by rivalries. Once a proud a Buddhist kingdom with a deep Muslim influence from trade and settlement, Rakhine's demographics were overhauled by British colonial administrators. Three major campaigns -- in 1978, the early 90s and now -- have driven Rohingya from Myanmar in huge numbers. The army, which ran the country for 50 years and still has its hands on key levers of power, has also gradually rubbed out the group's legal status. "The army wants to clear the Muslim community from Rakhine state," says Kyaw Min, a Rohingya and former MP, who has had his citizenship revoked. "The intention is to drive down the Rohingya population. They have achieved that in the south of Rakhine, now they are targeting the north." Last month a government-backed commission on Rakhine's troubles, led by former UN chief Kofi Annan, urged "all communities to move beyond entrenched historical narratives". But a few hours after its report was published, the militants attacked, sparking a ferocious military response that the UN believes amounts to "ethnic cleansing". "We will die if we go back," she told AFP from inside a monastery sheltering refugees in Sittwe, adding Rohingya militants are still preparing to strike. "They warned us to eat well... they said the next time we will not escape." Hindus once sold food to Rohingyas, spoke the same language and even cut the hair of their Muslim neighbours. But co-existence among the collage of ethnicities in Myanmar's Rakhine state has been ruptured -- perhaps irreversibly -- by the bloodshed of the last month.